The Thin Film Magnetism (TFM) group in the Cavendish have been working with a research team from Koc University, one of the leading Universities in Turkey, a collaboration which has now resulted in a Turkish spinout company called MEMSBIO. The team have developed a new sensing and excitation mechanism for MEMS-based micro-cantilevers, using optical sensing with a laser diode and excitation via magnetic fields. This means that the micro cantilevers can be manufactured using a single-layer MEMS process, which is lower cost than currently-used techniques. A further benefit is the extreme simplicity of the sensing unit, which requires no electrical or physical connections between the cantilevers and the reader. This means that the micro-cantilevers can be built into a compact, disposable cartridge, and a droplet of the liquid sample placed on top. The cartridge can then be inserted into a small hand-held reader, in much the same way as insulin meters are used today. 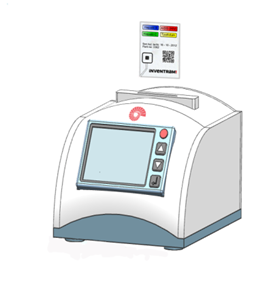 The first commercial application of the system is to measure the viscosity of blood, with the idea that a hand-held reader can be used by the world’s 10 million warfarin patients for self-monitoring of their blood to ensure they are receiving the correct dose of the blood-thinning drug. This can be done in two different ways, and unlike other systems, provides a direct measurement of the viscosity. Firstly, a single reading of viscosity can be achieved by measuring the vibrational characteristics of the micro-cantilivers in blood. Secondly, by mixing the blood with various reactive agents, a multiplex reading can be obtained for concentrations of thrombocytes, APTT, PT and fibrin, which affect the ability of the blood to clot, and are routinely screened prior to surgical operations. The challenge for the i-Team is to look at the use of the micro-cantilever system, both in its current bench top form, and its future hand-held form, and assess how it might best be used for blood measurements, as well as for the measurement of the viscosity of other biological and non-biological fluids.